This is just a very brief post about shooting my first full automatic firearm. This is the PM-06 set to full-auto with a 15 round magazine that emptied very fast! 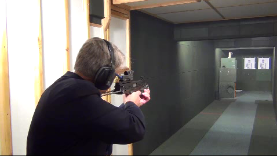 I got to shoot the PM-06 at one of the indoor test ranges of Fabryka Broni in Radom, Poland. Fabryka Broni also makes the Polish Beryl and its commercial version, the Archer Rifle. Both are .223 caliber AKs, which is a little unusual. Fabryka Broni started making them after Poland joined NATO, so that all NATO members use the same standard rifle ammunition. What’s more unusual is that the Archer Rifle AK is not only very reliable, but it is also highly accurate. It shoots 1″ groupings at 100 yards. Fabrya Broni says that combination of traditional AK reliability now coupled with super accuracy is due in large part to the Archer Rifle’s hammer-forged barrel. You can see a video of the hammer forging machine, including a slow motion close up of the machine actually hammering the barrel into shape here.